Hot dogs are one of our favorite summer standby meals. They grill up in a jiffy, and you can make them into almost anything you want by changing up the toppings. 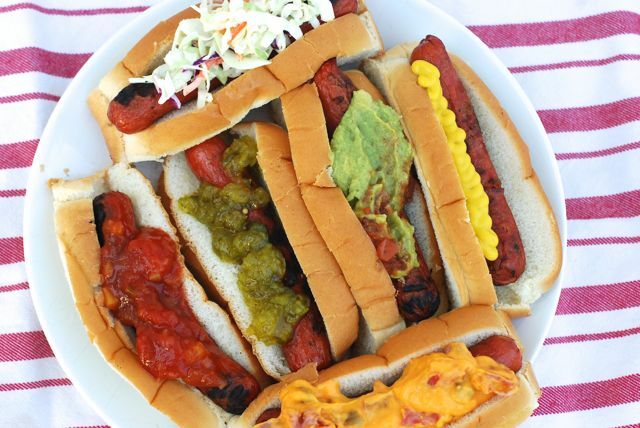 Instead of writing up lots of recipes today, I thought I’d share some of our absolute favorite ways to top hot dogs. You can see that we squeezed them all onto one dish for fun. My husband and I weighed in on all of our personal preferences to share with you! Base: Grill hot dogs until cooked through and place in a split-top bun. We don’t like our buns toasted, but some people do; hot dogs are delicious this way! Queso and bacon: Melt a simple queso dip in the microwave, drizzle about two teaspoons over a dog, and top with chopped bacon. Mexican hot dog: Top a dog with a big dollop of guacamole and salsa. Fruity dog: Top a dog with a big spoonful of Newman’s Own peach salsa. Cole slaw: Treat your dog like a lobster roll and top with it creamy, crunchy cole slaw. Plain & simple: Straight mustard always does a dog right.